We have a class JavaClub1 having a set of JavaClubMember1. The member does not know about the relation. Hibernate: update tjavaclubmember set club_id=? where id=? The class Club1 has no annotations related to the relation. // first take away the member from the club, than delete it. 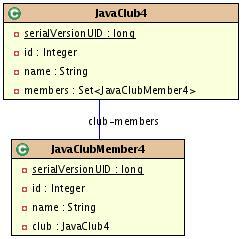 Hibernate creates one instance for each line of a result set.\newline If a club has two members, you will receive two lines when you select the club and left join the members. Your list would have double entries of clubs. You had to use a HashSet in former times or you received double entries. If you use criteria queries, take the following approach. 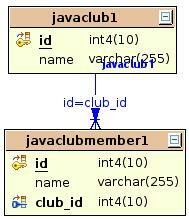 We have a class JavaClub2 and JavaClubMember2 where the club does not know about the relation. This kind of relation is more efficient than the one before. When you create a club with two members only three queries are issued. The @ManyToOne annotation specifies the relation. 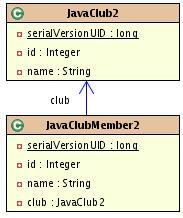 @JoinColumn(name="club_id") specifies how the tables are joined. It is optional and you may rely on the default values. @ManyToOne specifies the relation. @JoinColumn(name = "club_id", nullable = false) specifies how the table is joined and that a member cannot exist without a club, club_id cannot be null. @OneToMany(mappedBy="club") specifies that the relation is managed by the club property of the JavaClubMember3. XML mapping. Although you might choose, which side manages the relation, you must manage the relation on the many-side, if your foreign key (club_id) cannot be null. In this case set, you have to use inverse="true". See the discussion in xref:RefUsingrelationsandcascading. The resulting tables are once again the same. Do not forget to set and delete the relations on both sides. Sometimes you do not want to have a foreign key in the table of the many side but define the relation in a separate join table. 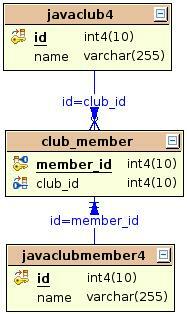 @OneToMany(mappedBy="club") defines the relation and that it is managed by the property club of JavaClubMember. 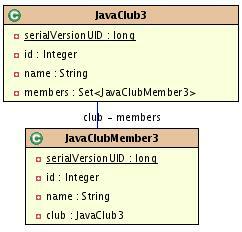 @JoinTable(name = "club_member".., specifies the join table. 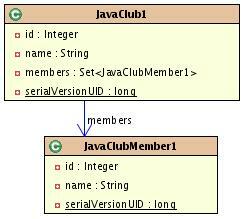 joinColumns specifies which columns reference the JavaClubMember primary key. 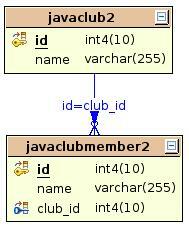 inverseJoinColumns specifies which columns reference the JavaClub primary key. XML mapping. On the JavaClub4 side, we define a many-to-many relation and set the JavaClubMember4 to unique. This might be confusing but is the correct approach. Annotation mapping is somewhat clearer for this kind of mapping. I set inverse to true, to have more efficient updates. The JavaClubMember4 (many side of relation) defines the join. Do not forget to set and delete the relations on both sides.